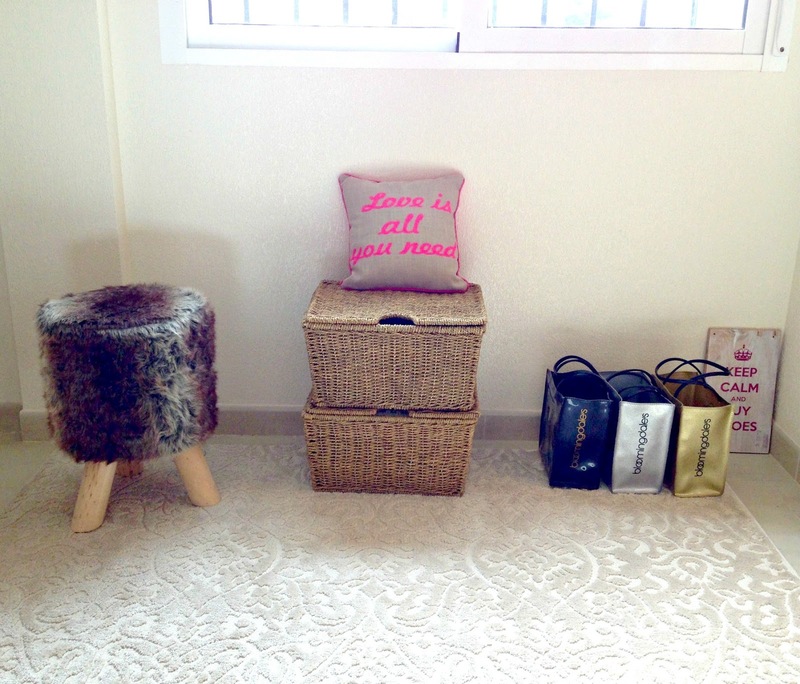 I'm sure if you've been following my little ol' blog, you would of noticed now and then I've been chatting about my 'dressing room' in Spain and of course, if you follow over on Pinterest, you would of seen my board 'Dressing Room Inspo'. So, carrying on from my last post about our little Spanish vacay, (if you missed it, you can check it out here!) 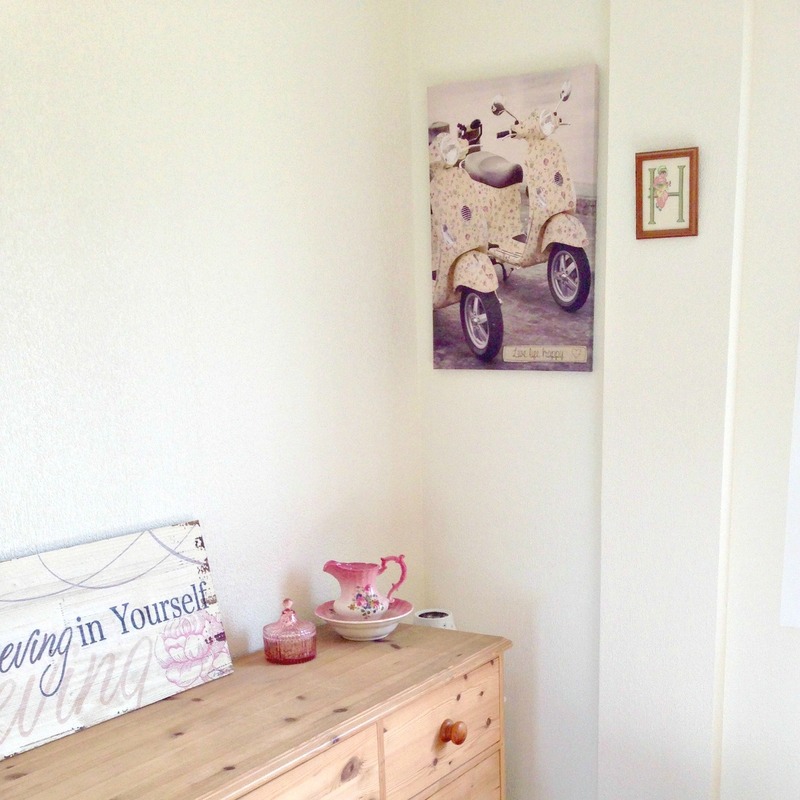 I thought it was about time I show you some of the progress of my little dressing room! Now, it's not completely finished as there's still a few bits to do, but take a peek below and I'll show you around! 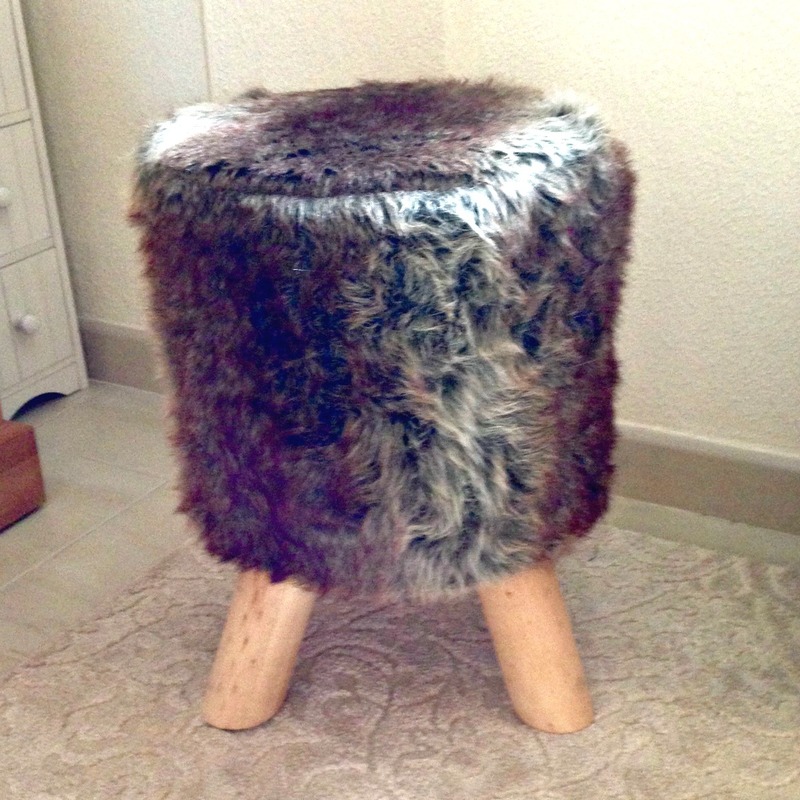 My gorgeous new fluffy stool! I had been thinking a lot about the 'seating' situation. My first ideas were of a cool, boho inspired, patchwork armchair, then it moved on to a round white ottoman, to sit in the middle of the room, all classy and fancy! Then I realised, even though I loved my ideas, I think they would be too overpowering for the petite room and I don't want it to feel 'cluttered' at all. When we visited Spain for a weekend back in February, I spied this little chap and I knew he would be perfect! (On sale too! You know I love a bargain!). The stool is just the right size to pull up to the mirror and perch on whilst drying my hair and so light and easy to move around the room. My baskets. Us girls love our baskets don't we?! I've had these two for ages now and was so happy to find them buried in the storage that we had sorted out and moved to the house last summer. At the moment I'm storing my winter hats, gloves and scarves in them. The cushion on top is fab isn't it. From good ol' Primark! I love the home section in Primark, you can pick up some really cute bits in there, so affordable and the quality is good too! (further on you'll see some more bits I've purchased from there!). My little Black, Silver & Gold Bloomindales Bags from the Dubai Mall! Bloomingdales, do I need to say anymore!? The little wooden sign peeking from behind, 'Keep Calm and Buy Shoes'! I got this from a little craft stall here in RAK at a night market one time, I need to get some rope and find a spot to hang it up on the wall. 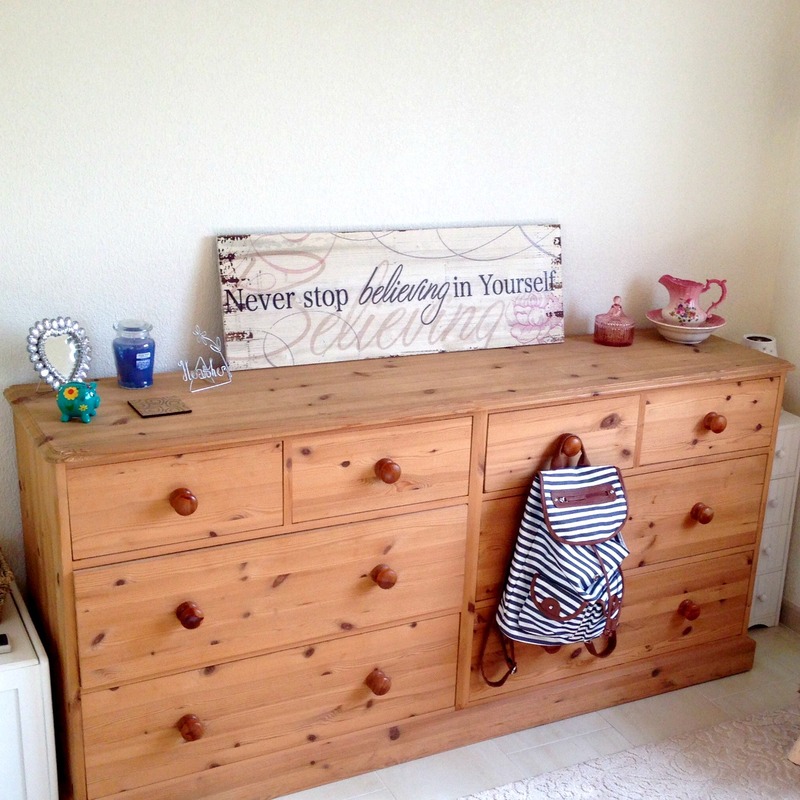 OK - Along this wall you have my pine chest of drawers. This has traveled around with us a fair bit and I'm chuffed how well it fits into this space. You can't see very well in this picture, but the drawers are really quite deep (especially the bottom ones) so it's great for storage! Also, every girl should have some sort of flat surface, whether it's in a dressing room or your own bedroom, it's important to be able to display little girly trinkets and of course have somewhere to place make-up, accessories and clothes on whilst getting ready. The trinket next to the Jug & Bowl is again from Primark. It actually has a lovely smelling candle inside too. I love the 'art deco' look to it and because it's made of glass, it seems a lot more 'high end' then it actually is! (I bought this a couple of weeks a go when we were in Spain, so I'm sure it's still in stock if you like it too!). Up on the wall - the tapestry letter 'H' my other Grandma made for me when I was little. Again, I found it tucked away in a box and I knew it had to be displayed in my little space. The Vespa canvas - from Primark! 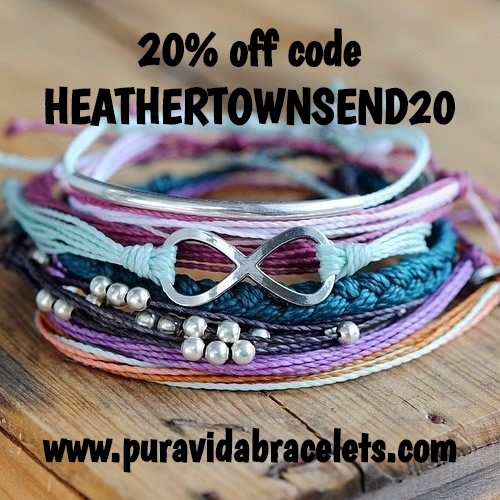 Again fab quality and very purse friendly! I'm not sure if you can see that well, but on the bottom right-hand corner of the canvas it says, 'Love Life Happy'. On the other side of the dresser there's a few trinkets I have had for ages! The sparkly heart mirror - well, I am called Suncream and Sparkles, so Sparkles do pop up now and then, hehe. The mirror is just temporary! I'm still on the look out for a new one. This one has been knocking around for years now and will probably end up down in the den once that has all been done. For now though, it will probably just move from room to room, haha, until it finds a permanent home. 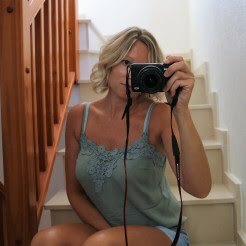 I want a much larger full length mirror to lean up against the wall, very tall and wide! Watch this space! The picture hanging up is of my beloved cat Tigger. He passed away over 20 years ago now and one Christmas my Step-Dad had this made. The lady who painted it, did it from photos of Tigger, so very clever and is a perfect match, just as though he was posing for her! The chest of drawers in full. The wooden picture resting on top was one of the first things I bought for my dressing room. I saw it in Leroy Merlin in Spain and bought it immediately. 'Never Stop Believing In Yourself'' says it all. I was going to have it put up on the wall, but I quite like it as it is, on top of the chest of drawers, What do you think? My rug is also from Leroy Merlin in Spain and I love the swirling pattern going through it. The colour is very subtle and gives the room a really calm, relaxing vibe. When I was first thinking about what to do with my dressing room, I had thoughts of having floor to ceiling shelves all the way along the back wall where the chest of drawers are. I thought it'd be so nice to be able to display my shoes and bags just like you see online and in fancy celebrity dressing rooms. Further thinking though, I thought it might make the room feel crowded and even smaller then it is. I also have to think about when the fur-babies move over with us, they would be straight up on the shelves knocking everything over, haha! I hope you've enjoyed having a little peek around. This post wasn't planned at all, so the pictures I've got, are just quick ones I snapped on my phone whilst we were there. I do love having my own little dressing room. 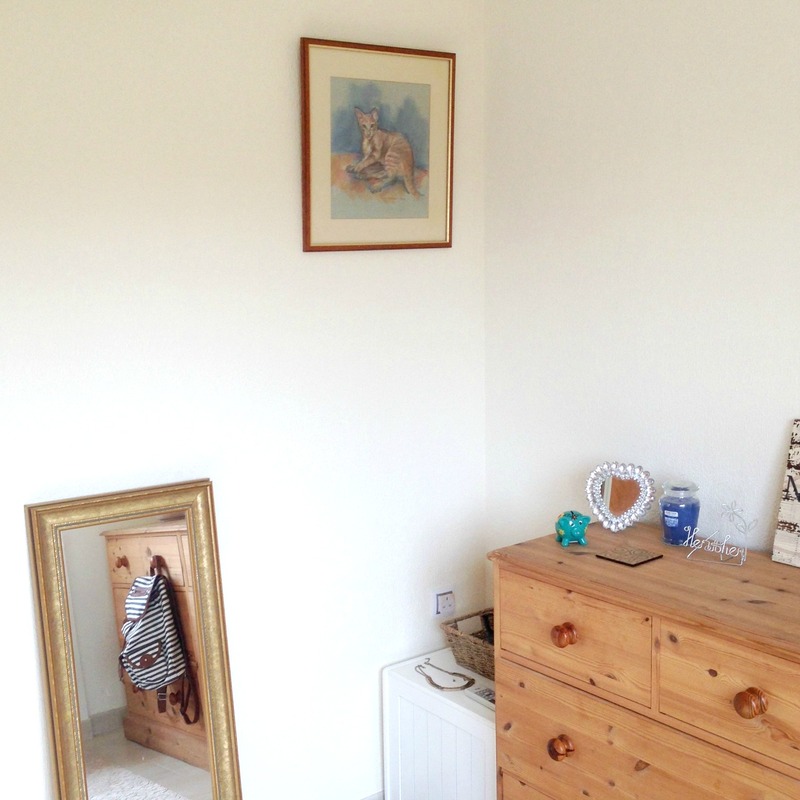 It's also a lovely space to be able to put some of my personal items that may not 'go' with the rest of the house. I love mixing old and new and am loving how it's all starting to come together. Really cute, love the Bloomingdales bags!